Use Switcher Studio to broadcast to your Ustream. account: http://www.ustream.tv/. Once you are logged in to Ustream, go in your Account menu by clicking the avatar at the top right, and choose “Channel settings”. On the left side menu, under CHANNELS, select your channel (there is at least one by default). If your channel name is “Hello World”, your audience will be able to watch your production on http://www.ustream.tv/channel/hello-world. In your channel's submenu on the left, choose “Broadcast Settings”. A new menu appears containing an option called "Encoder settings". Click "VIEW" on the right to reveal two very important parameters: the RTMP URL and the Stream Key. Log in to your Switcher Studio dashboard and create a new channel using the "Channel Settings" menu. 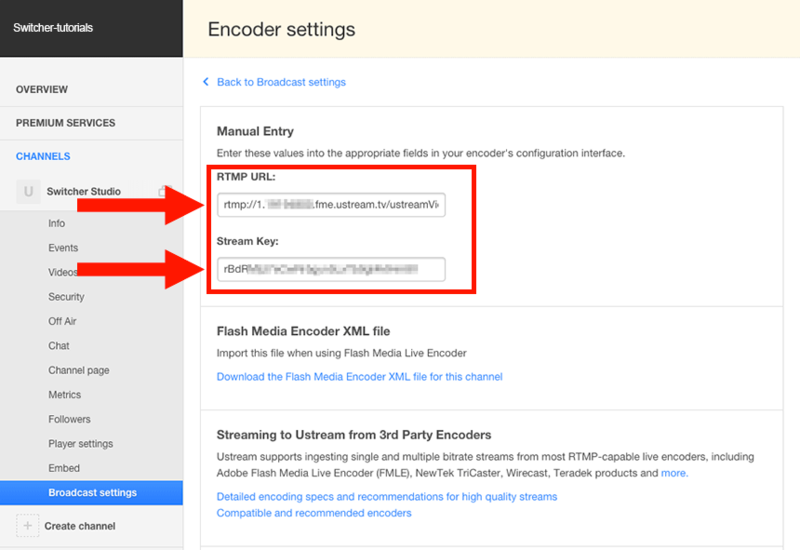 In the "Server URL" field, enter the "RTMP URL" from your Ustream Encoder settings. In the "Stream Key/ID" field, paste the value from the "Stream Key" from your Ustream Account. To optimize your output settings based on your Internet speed, select a preset (Low-Med-High-HD) or create a custom configuration. In the “Server URL” field, enter the text you saw on Ustream's site, under “RTMP URL”. In the “STREAM” field, enter the text you saw on Ustream's site, under “Stream Key”. Tap “OK” to close the RTMP parameters window. You are now ready to stream. Just tap “Rec + Broadcast” to start streaming. Your audience can watch your production live, on http://www.ustream.tv/channel/hello-world (replace “hello-world” with your channel name).